The New York Times has an article today about a new rodent discovered in Southeast Asia that’s so different, it’s been placed in its own family. 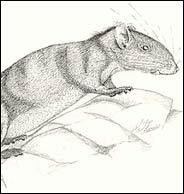 ‘Oddball Rodent’ Is Called New to Science. They live in the forests and limestone outcrops of Laos. With long whiskers, stubby legs and a long, furry tail, they are rodents but unlike any seen before by wildlife scientists. They are definitely not rats or squirrels, and are only vaguely like a guinea pig or a chinchilla. And they often show up in Laotian outdoor markets being sold as food. It was in such markets that visiting scientists came upon the animals, and after long study, determined that they represented a rare find: an entire new family of wildlife. The discovery was announced yesterday by the Wildlife Conservation Society and described in a report in the journal Systematics and Biodiversity. It will have red blood cells that lack nuclei. It will have three middle ear bones. It will have continuously growing incisors. And so on. I can make these predictions based on known synapomorphies within the mammal or rodent lineages. These are characters inherited from the common ancestors that all mammals (or rodents) share. If this new species is not related through ancestry with other rodents and mammals, and was perhaps “specially created”, there is no reason to suspect that it would have these characters, especially since they are not relevant to the morphological appearance of the animal.